I haven't traveled anywhere in the past year, but if I had, I would have surely used Hopper. The app, which was released a little more than a year ago, monitors flight prices and predicts the best time for you to purchase your tickets for the lowest possible price. However, there was one aspect to Hopper that was lacking: it just looked at all flights and didn't take into account your personal preferences. That has changed with the latest update to the app and the new Watch Filters. Now you can specify whether you prefer your flight to be non-stop or you don't mind, if you like shorter layovers, and if you want it to dismiss all basic fare flights where you'd need to pay more for luggage or seat selection or food. Hopper would then only alert you to the best deals for flights tailored to these preferences. Filters….finally! Until now, Hopper has been providing guidance on how to score the cheapest deal. 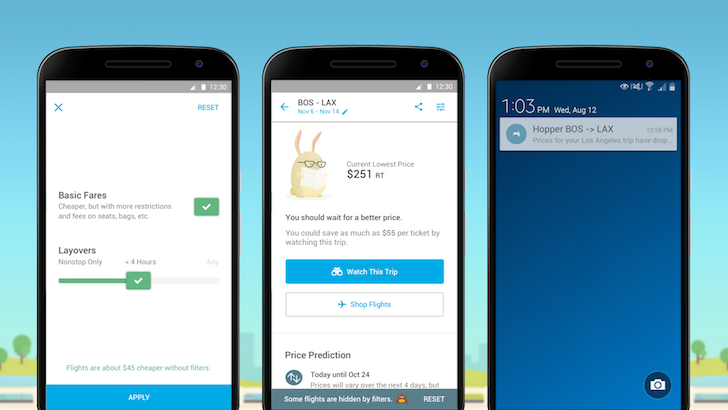 With this release, Hopper can now predict the best times to buy based on your personal preferences, like flying nonstop, and alerts you to only flight options you care about. Tell us what you think at [email protected] We want to hear from you! The team says that even with this added granularity, Hopper is still about 95% accurate at predicting the perfect time to book your flight. You can read more about the impact of the filters and some stats related to them in the source link below. As for the app, it's free and available on the Play Store.